I am unsure if this type of information is helping anyone to decide. I, as a pediatrician, am very concerned about the use of caffeine in children and teens. It’s a time we should be focusing on how to help them learn and prepare for their future. But in a society that believes the answer for every time one is tired is caffeine; the use of caffeine in children is growing faster and in higher amounts than ever before. I am alarmed to see that the market is encouraging our youth to choose caffeine for energy. Our children need a healthy diet and proper sleep (not caffeine) for energy. Teenagers are back in school and even more prone to use energy drinks as they get into the day to day grind. Typical diets are so far from perfect. I believe we need to supplement their diet choices. But not only due to their food choices, the fact that we eat a majority of food that is pre-prepared for us already means that food has lost a great amount of nutrition. Nutrition studies indicate that once we wash, prepare, or cook foods there is a great loss of the nutrient value. Preston Andrews, PhD, a plant researcher and associate professor of horticulture at Washington State University states, “the nutrients in most fruits and vegetables start to diminish as soon as they are picked.” These already-prepared meals are even a stronger reason we should supplement with the daily essential vitamins and minerals they are lacking. Children need B vitamins, Vitamin C, and minerals like magnesium for energy, not caffeine. Lately I have looked at Rhodiola rosea as a caffeine alternative for young adults. Thinking on how this appears to help provide energy but doesn’t appear to interfere with the health of the body as caffeine can. Is this a great way to start to re-educate the population on energy drinks. Can we find a better alternative? Would this not be better for the body and the brain? 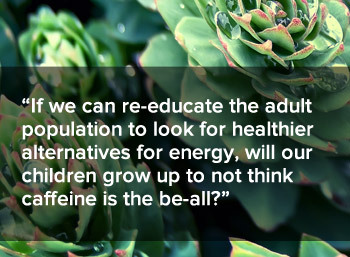 If we can re-educate the adult population to look for healthier alternatives will our children grow up to not think caffeine is the be-all? Adaptogen: it causes minimal disturbance to the normal physiological function, the action is nonspecific, and it has normalizing action. No negative effect known on digestion. 1 Liu J, Sui X, Lavie CJ, Hebert JR, Earnest CP, Zhang J, Blair SN. Association of coffee consumption with all-cause and cardiovascular disease mortality. Mayo Clin Proc. 2013 Oct;88(10):1066–74. doi: 10.1016/j.mayocp.2013.06.020. Epub 2013 Aug 15. 2 Lucas M, O’Reilly EJ, Pan A, et al. Coffee, caffeine, and risk of completed suicide: Results from three prospective cohorts of American adults. World J Biol Psych. 2013 Jul 2 [Epub ahead of print]. 3 Hildebrand JS, Patel AV, McCullough ML, et al. coffee, tea, and fatal oral/pharyngeal cancer in a large prospective US cohort. Am J Epidemiol. 2013 Jan 1;177(1):50-8. doi: 10.1093/aje/kws222. Epub 2012 Dec 9. 4 De Bock K, Eijnde BO, Ramaekers M, Hespel P. Acute Rhodiola rosea intake can improve endurance exercise performance. Int J Sport Nutr Exerc Metab. 2004 Jun;14(3):298–307. 5 Adamchuk LV, Salnik BU. Effect of Rhodiola rosea extract and piridrol on metabolism of rats under high muscular load. Proc Inst Cytol Russ Acad Sci. 1971;89–92. 6 Abidov M, Crendal F, Grachev S, Seifulla R, Ziegenfuss T. Effect of extracts from Rhodiola rosea and Rhodiola crenulata (Crassulaceae) roots on ATP content in mitochondria of skeletal muscles. Bull Exp Biol Med. 2003 Dec;136(6):585–7. 7 Maslova LV, Kondrat’ev BI, Maslov LN, Lishmanov I. The cardioprotective and antiadrenergic activity of an extract of an extract of Rhodiola rosea in stress. Eksp Klin Farmakol. 1994 Nov;57(6):61–3. 8 Abidov M, Grachev S, Seifulla RD, Ziegenfuss TN. Extract of Rhodiola rosea radix reduces the level of C-reactive protein and creatinine kinase in the blood. Bull Exp Biol Med. 2004 Jul;138(1):63–4. 9 Kim SH, Hyun SH, Choung SY. Antioxidative effects of Cinnamomi cassiae and Rhodiola rosea extracts in liver of diabetic mice. Biofactors. 2006;26(3):209–19. 10 Brown RP, Gerbarg PL, Ramazanov. Rhodiola Rosea: A Phytomedicinal Overview. Herbalgram, 2002; 56:40–52. 11 Stancheva SL, Mosharrof A. Effect of the extract of Rhodiola rosea L. on the content of the brain biogenic monamines. Med Physiol 1987;40:85–87. 12 Furmanowa M, Skopinska-Rozewska E, Rogala E, Malgorzata H. Rhodiola rosea in vitro culture: phytochemical analysis and antioxidant action. Acta Soc Bot Pol Pol Tow Bot 1998;76(1):69–73. 13 Spasov AA, Wikman GK, Mandrikov VB, Mironova IA, Neumoin VV. A double-blind, placebo-controlled pilot study of the stimulating and adaptogenic effect of Rhodiola rosea SHR-5 extract on the fatigue of students caused by stress during an examination period with a repeated low-dose regimen. Phytomedicine 2000;7(2):85–9. 14 Darbinyan V, Kteyan A, Panossian A, et al. Rhodiola rosea in stress induced fatigue--a double blind cross-over study of a standardized extract SHR-5 with a repeated low-dose regimen on the mental performance of healthy physicians during night duty. Phytomedicine. 2000 Oct ;7(5):365–71. 15 Shevtsov VA, Zholus BI, Shervarly VI, et al. A randomized trial of two different doses of a SHR-5 Rhodiola rosea extract versus placebo and control of capacity for mental work. Phytomedicine. 2003;10:95–105. Dr. Wendy C. Daly is originally from Connecticut. She graduated from Hartford Hospital School of Nursing in 1972 and Eastern Connecticut State University in 1975. She practiced as a nurse for six years before entering medical school. Upon graduating from the University of Louisville School of Medicine, she completed a three-year residency in Pediatrics in Louisville and has been board-certified by the American Academy of Pediatrics since 1988. Prior to starting Brownsboro Park Pediatrics, she worked as an attending physician in the emergency room at Kosair Children's Hospital and spent four years at the Park DuValle Community Health Center. Dr. Daly is married to Dave Ingram and has two sons, Greg and Jordan Daly.